Welcome to the GOTM Entry #2 Voting Thread! 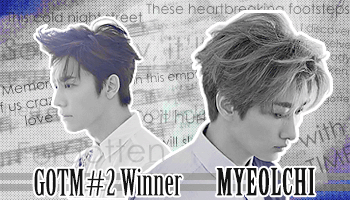 This month's theme was Horror/Dark, chosen by our previous winner, Myeolchi! This round's too damn hard to cast a vote for, I tell you. Everyone (except meh, I s'pose, 'cuz it was sooooo out of place HAHAHAHA) has really done vey well! Pat yourselves all on the back, wherever you are. My vote this round goes to Myeolchi (again), by a very very very narrow margin. I like the use of the red white black color scheme, and the positioning of the various parts used makes the whole pic come together as a whole very well. I especially like the taste for true blood text at the left of the graphic - the font you used and the arrangement of the words are more or less what I would use in arranging a set - as in my The King and I graphic last GOTM. That said, I also love the graphics of Aira and Elinicia, as well. Aira's concept is awesome, what with the flickering effect used on the character. It's similar to what you see ghosts do on horror films, where they flicker and then the next moment they've shunpo-ed right in front of you, like wtf how did that happen. Thumbs up for that. I also dig the color theme of brown and black, but I guess I would have liked to see more particulate matter swirling around, to create the whole sandstorm thing going on. Elinicia's piece reminded me of security camera footage - those of the paranormal variety are usually in greenish tint, or I just don't watch enough paranormal reality TV. Also, the LQ-ness of the stock images used (the ssshhh guy, and the pair of eyes, in particular), add to that CCTV feel. IDK what others would think of that, though. I also like the patches of white bordering the image, which balances out the green bordering to black parts of the pic. The text for outlast, though, I find a bit too blurred for my taste, especially to the right side, tinted with green. Just a bit, tho. I would have voted you all if I could. Really. 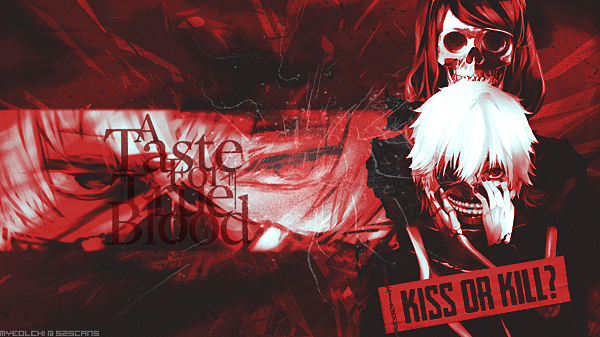 Lol I guess it's imposssible NOT to have any Tokyo Ghoul entries with this theme. Dani-chan: Ooh our first traditional work (to my memory, at least xP)! Nice shading work; I don't have much patience for things like shading. But as my art teacher says, "Don't be afraid of the dark!" Artwork tends to have more impact if there is more contrast. Don't be afraid to shade darker! The image is blurry for me because slow internet, but I'm kinda intruiged by the white tag attached to his toe. Is this a medical tradition, a referance to some literary work that I don't know about or something, or both? Kaneki Ken! Wow, you went so far as to making a gif for this! Ai-chan, the text is somehow difficult to read though—mainly the "I" or even the whole "I am" part. Maybe make the background even lighter at the beginning at the gif? Actually, going with Dani-chan's suggestion and adding more of the "sand" effect might help solve this. Eli-chan: This nickname os okay, right? Haha no I cannot outlast. Definitely not. The guy is scarryy~ it's even better since you left out his eyes, which basically helps humans identify who is who. Doing so also cuts out a lot of emotion, and since there are no eyes speaking to us, it's really quiet out here. The black space near the middle/left kinda bothers me since it's just this empty black expanse. I see some blurry images between the hush-man and the darkness, which makes me feel as if there should be more to the graphic. AND HOLY CRAP ARE THOSE GLOWING EYES RIGHT OVER THERE maybe if you moved them a bit down and to the right, they would've gained more attention (and help fill up the black expanse). The way it is now, the eyes are totally overpowered by the impact of the man on the right side. And yeah, maybe instead of blurring the end of the text, make it seem staticky? This is probably just personal opinion, but it looks kinda moldy and slimy right now, which doesn't give a sense of "Can you last?" Since mold/slime last very long very easily. On the other hand, static would match the effect you used for the border and give a more unstable feeling to the word/graphic, which would better suit the words that you chose. I'm going to sleep now~good jo, everyone! Hope to see you at the next GOTM (and hopefully I'll get my lazy self to join too xP)! Anyway here's my comment . Dani-sis: I like your entry. You are getting better in drawing. Your entry have potential but it lacks the dark/horror factor. Aira aka Mom: your entry looks cool and i love the smoke effects but it would be better if it is looped nicely. Its just that im expecting something in the end lol. Mia-sis: Your entry looks scary at all! I love how it is all red and bloody. Theres nothing i can comment about it because it really fits in the theme! I voted this one . Myeolchi - Tbh I also wanted to vote for this. too bad I can only choose one. As expected, you're really good at using textures. Something I am struggling to do with my works. So I really admire your works.